Making a wish on a shooting star gets a little more down to Earth with this meteorite jewelry. 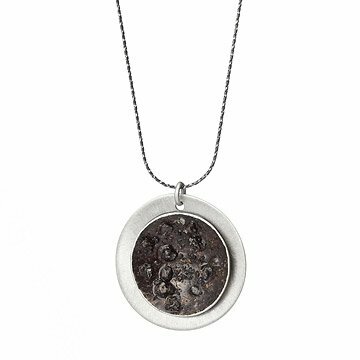 Carry a reminder to always wish big with this shooting star necklace by Andrea Vidmar, made from meteorite flakes. When you see a shooting star in the sky, it's not a star at all, but rocks that have broken away from asteroids and comets. Once these rocks hit the Earth's atmosphere, they burn up and the remaining rock falls to Earth as a meteor. That's where Andrea comes in and smooths out the meteorite flakes to create an organic silhouette that was thousands of years in the making. Handmade in the Las Vegas, Nevada. Andrea Vidmar's unconventional childhood playing among Roman ruins and people watching sparked a constant curiosity from an early age. Fascinated by the abundance of natural treasures that surround her on a daily basis, the Las Vegas-based artist combines her curiosity with a keen eye to bring truly unique pieces into existence. "If I start my hunt on a mission to find items, I get into a headspace at looking at the world differently and it makes me live in the moment and connect," she says. Her driving motivation is to create wearable art to express herself and her sense of beauty; the ability to share this with others is her inspiration. Use polishing cloth as needed. Do not use any cleaners or liquids on Meteorites. Meteorites may be cleaned with dry cloth or dry brush. Do not wear in shower and remove before swimming. Possible Con? I am afraid to get it wet, not sure how the material would hold up under water. No way to contact seller to ask. I wear it everyday & forgot I had it on and wound up wearing it in the shower, took it off about half way through when I remembered it was on. Really hoping it doesn't damage the necklace. Pro: I've showed it to everyone I have come in contact with since I got it. They all think it is SUPER unique and awesome! Excellent, thoughtful gift. Arrived in a timely manner. She loved it!!! Very disappointed that mine in falling apart. the largest piece of meteorite fell out and it is very noticeable and disappointing. No way to contact the maker for her to fix it, so quite disappointed really love this piece and wish I could wear it without a big hole of glue and no meteor. This is a lovely necklace! This is a lovely necklace. A friend of mine was fond of saying "We're all stardust, harvesting starlight." I wear this necklace, and remember him fondly. Purchased this for a close friend who has a major interest in astronomy.... She was floored. The chain was equally as interesting and set off the meteorite necklace perfectly. This was the perfect gift for my daughter who loves everything to do with space - stars, moon, etc. This made a unique gift because each one is made differently so there will be no two alike. She will treasure this gift for many years to come. Our daughter loves astronomy and we think she will love this piece of the solar system! Loved that each one is unique and comes from ancient stardust.